Environmental problems do not respect international boundaries, and as a consequence, environmental issues are increasingly a matter for negotiation in which the role of international law is crucial. However, the law itself and the accompanying institutions are only beginning to recognize the full implications of the issues. Greening International Law is a collection of essays by leading legal scholars and lawyers, who asses the extent to which the law and legal institutions have been “greened” and discuss the ways in which these laws will have to adapt to deal effectively with the issues now arising. These essays reflect the excitement of watching a new system being formed—just as if one were able to witness again the early days of American federal decision making. Cases such as the Mexican tuna case and the Danish bottle-deposit return case will have enormous significance in deciding the degree to which individual countries will be able to maintain their own environmental policies in the face of economic pressure from other, and at times larger, neighbors. The battles over the future of the oceans and the arctic territories are fraught with enormous portent for future economic development, much as were our early political and legal battles over the open lands of the American frontier. 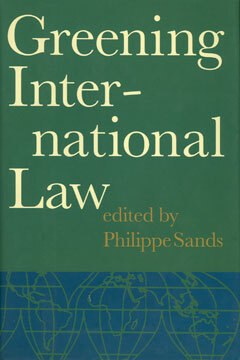 With essays by distinguished American experts such as Christopher Stone, Richard Stewart, and Daniel Bodansky, and an extensive historical introduction on the evolution of the field by Philippe Sands, Greening International Law is a book of importance not only for lawyers and environmentalists, but for all concerned with our economic and political future. Philippe Sands is a professor of law at University College London.